“The Senator” is the nickname of what was a 3500 year old Cypress Tree in Big Tree Park in Longwood Florida. Sadly, it burned down in January of 2012 when a drug addict lit a fire in the hollow at the base of the tree because “it was dark and she wanted light to see the drugs she was using.”. The culprit confessed and is expected to be sentenced shortly to either probation or a few months in prison. “Back when the tree burned, NPR covered the story the following morning. Within an hour I was cold calling county personnel and getting passed from one person to another. I was trying to encourage them to make offerings to school systems for educational purposes. After many months I received an email that the decision had been made to take applications for remains. I contacted my local schools and museum trying to get them to apply. I even provided the applications. No one applied. So I decided to try on my own. Eventually I did receive a piece of the outer part of the tree, but pick-up had to be in person. The story after that is long and convoluted but eventually did find someone there to accept payment to collect and ship the piece. Upon arrival the box was open and the piece had clearly been out. 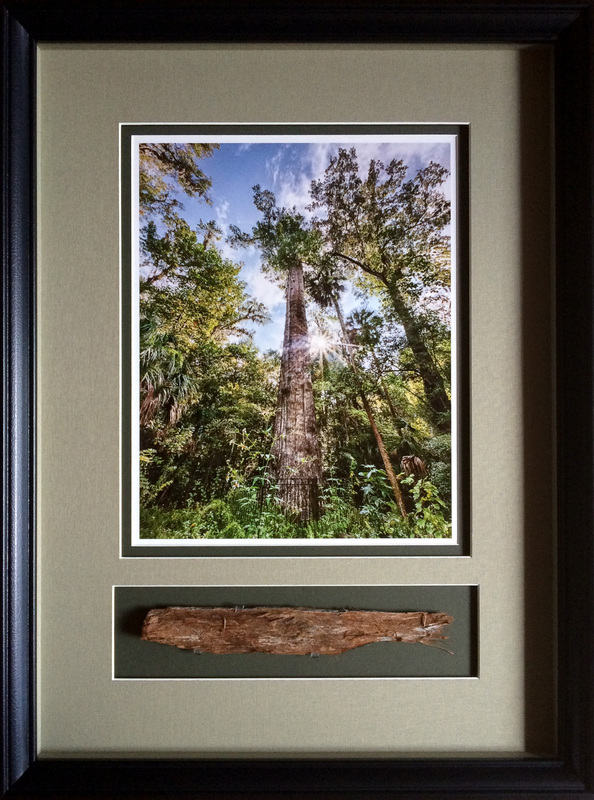 A shadow box display of a photo of the 3500 year old Senator Cypress tree in September of 2011 along with a small piece of the remains from after it burned down in January of 2012. This means a great deal to me and I’ll treasure it as a reminder of visits to the Senator before the tragedy. I’m exceptionally grateful to Tony for his generosity in sharing with me. Topaz released a new plug-in recently, called ReStyle. You can download any of their products for a free thirty-day trial, so I thought I’d give it a go. This isn’t a full review or tutorial (I haven’t used it long enough for either of those). But I have used it a bit so I’ll try to introduce you to some possibilities with three examples I’ve played with. If you want to see the “before” versions, I’ve included them towards the end of the post. I had trouble with the white balance in this photo of Marineland beach at dawn. I could have separately adjusted the color balance on the sky and ground using layer masks in Photoshop or gradients in Lightroom. Instead, it was easy to pick out this version from the grid displayed inside ReStyle. It’s interesting how remapping changed the color in the beach and rocks differently from the sky. 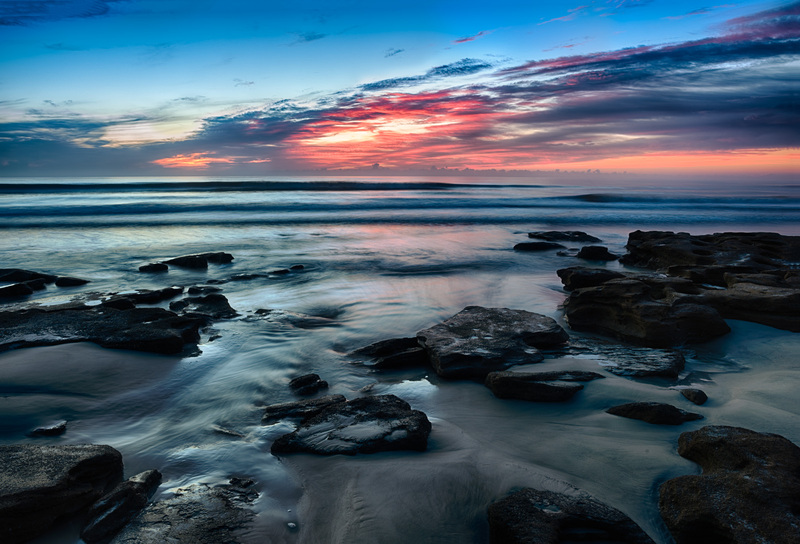 Down on the beach at dawn (after Topaz ReStyle). ReStyle maps color and tone statistics from a selected style to a target image. It seems like Photoshop’s “Image/Adjustments/Match Color” command. When you do this in Photoshop, you have to supply an image with the colors you’re trying to match. ReSyle comes with over 1000 presets and provides control / adjustment of the results that aren’t easily available in Photoshop. There are so many presets that they’re overwhelming, but ReStyle breaks them down into collections (e.g. “Landscape”), and you can mark your favorites. You can show a collection or your favorites as a grid applied to your photo, which makes choosing one very simple. You can also search for similar styles by color or by name. Within each style, you can further adjust the hue, saturation, and luminance of the five colors in each style, as well as the opacity, original image “Texture” strength, and others variables. It also includes mask / selections controls to apply the effects selectively. There’s a lot more info available in the manual at this link. 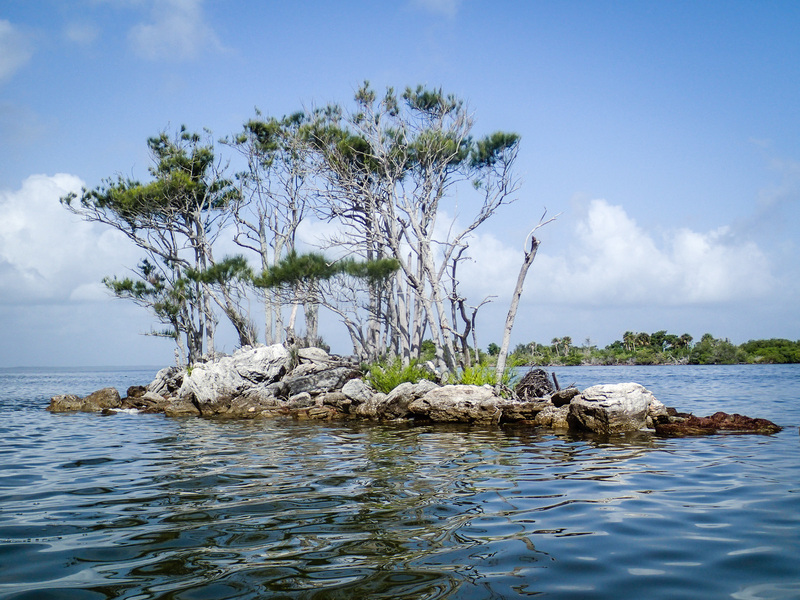 In this photo of some struggling trees on a small rocky island near Haulover Canal, I wanted a more dramatic color palette. Once again, it was easy to pick out this version from a grid of possibilities. For this infra-red photo of sea oats on the beach that I made in Fred Howard Park near Tampa , I wanted a different look from a typical IR false color image. I like this color mapping I found in ReStyle . There are so many presets, options and adjustments that ReStyle can be a little overwhelming. It’s not hard to use, but it is hard to grasp all the possibilities and decide what to do. It’ll take a bit more time for me to get comfortable with it, so I’ll have to play with it some more. Before: Down on the beach at dawn. Before: Sea oats – False color infra-red processing. Summary: Do you have to use plug-ins? Of course not, but they’re useful and save time. And ReStyle seems to offer something I haven’t seen elsewhere. It’ll definitely make your images look different. Are they better? I think ReStyle improved these three images, but only you can decide for your photos. Will this fix all of your problems and should you use it on every photo? Definitely not – I’m new to the tool, but on several photos I tried, I couldn’t get anything that I thought looked good. But it does look like something that’ll be good to have in your bag of tricks. Off topic public service announcement: I’m always telling you to get out and enjoy nature. I also need to remind you to protect yourself from the sun. I had two skin cancers removed last week. I’m fine – but it’s not the most pleasant thing to go through. And it can be much, much worse than mine were. So when you’re out in the sun enjoying nature, please protect yourself. Use sunscreen, wear a hat and long sleeves, stay in the shade as much as possible, etc. The sun is brutal, especially in Florida. And no one wants to suffer the consequences of too much exposure ten or twenty years down the road. Thanks for stopping by and reading my blog. Now – go make some photos! And use sunscreen! Sorry this week’s post is a little late – we were pretty busy all weekend. So just a short entry this morning. Yesterday I went over to Merritt Island National Wildlife Refuge with Lynn, Mary, and Mary’s friend Monette. Lots and lots of birds (a story for another day). On the way home, we stopped by the Fort Christmas Historical Park in Christmas, Florida. They were having their 35th annual “Cracker Christmas” event. Along with tours of the permanent structures at the park, there were demonstrations of early settler life in Florida and many booths selling crafts. There were also some Civil War reenactments going on. When I saw this group posing in front of an old view camera, I just had to make a photo. Civil War group portrait: A group of Civil War reenactors pose in front of a view camera during the 2012 annual “Cracker Christmas” event at the Fort Christmas Historical Park and Museum. I cloned out some distractions, leveled and cropped, tweaked the color, contrast, sharpening, and then converted to a sepia toned B&W. I like the “after” version better. How about you? Today, I had some time and a new computer I wanted to try out, so I went looking for a photo to reprocess. Take a close look at the two images below. The differences aren’t as obvious in these smaller versions, so if you click on them, you can go to Flickr and look at large resolution versions of each so you can see the changes in detail. Nikon D80 @ ISO 100, Nikon 70 – 300 lens @ 260mm, f/5.6, 1/320 sec. I made this photo back in April of 2007 in the bird rookery at the St. Augustine Alligator farm. The version above is “straight out of the camera (converted to JPG with Lightroom 2.5). It has potential, but the blown sky is bad and the levels and sharpening need work. The version below was processed in CaptureNX2 for levels and curves. I also created a version that was sharpened, and a third version that adjusted the sky. I then opened all three in Photoshop and used layer masks to choose the portions of each that I wanted in the final photo. After saving the result, I imported it into Lightroom, tweaked clarity and vibrance, and cropped it slightly before once again exporting this JPG. Same, photo: re-processed and slightly cropped. I guess you can tell I’m not a straight out of the camera, photo journalist type photographer. I like the second version much better than the original. Do you? The interesting thing to me is that almost 3 years after I made the photograph, I can go back and reprocess it with better software and better techniques. Since I captured it in RAW, I have much more flexibility in what I can change. Processing RAW is like having the original light and framing fixed, but being able to tweak the camera settings. Do I need Photoshop, CaptureNX2, and Lightroom? No, but each has strengths and I believe that if you want the best image you can get, you need to have SW and understand how to use it. Or at least shoot in RAW so that when you do get the software and techniques, you can go back and have another go at things. I listen to the Digital Story podcast . The June 2007 photo assignment is “Before and After”. The idea is to submit two images showing how you “developed” the final photo. I also just bought the book Examples, The Making of 40 Photographs , by Ansel Adams. He writes about how he re-visited his negatives over the years and was able to make better prints with additional effort / technique. Photo 4 shows the final result after using Lightroom’s wonderful B&W conversion tool. You can play around with different color channels to emphasize different things in the picture. It’s like being able to use color filters over your lens after you’ve taken the picture! I think the final result is much better than the original. Here’s a link to my gallery with all of the images in sequence. You can see all of the entries in the Digital Story June photo assignment here .